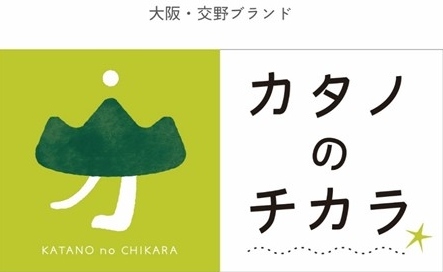 After New Year week, the first event is Toka Ebisu Festival on January 10th. When counting days in Japanese, the 10th of each month is pronounced not as “Jyunichi” but as “Toka”. Therefore, the festival for Ebisu on January 10th is called Toka Ebisu. This festival is mainly well-known in west Japan. Particularly, in Kansai Area, plenty of shrines and temples hold Toka Ebisu Festival. The reason is that Ebisu is regarded as the symbol of trading and business. In addition to this festival, there is another important event on January 10th. It is Daikokuten Festival. Daikokuten is a member of Shichifukujin (seven fortune deities) as well as Ebisu. 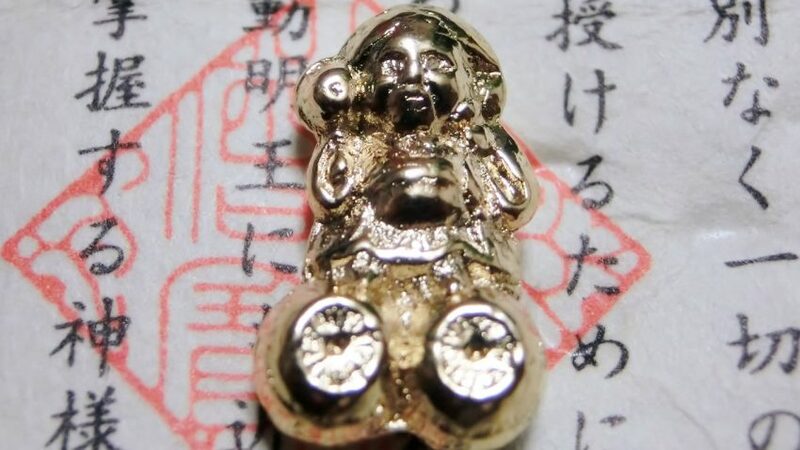 Daikokuten is the symbol of wealth and prosperity. The purpose of trading and business is to make a lot of profits. In other words, all business persons aim at wealth and prosperity in their business. Daikokuten is deeply associated with Ebisu which is the symbol of trading and business. Daikokuten is also the deity of land. Foods and natural resources are the gift from the land blessed by Daikokuten. Even the sea resources are circularly relating to the land. The sea is the origin of all creatures on the globe. It brings a lot of sea foods and natural resources to our lives. Land and rivers also supply organic or inorganic substances to the sea. The relationship between the land and the sea can be said to be circular. Ebisu has a fishing rod with his right hand and a red sea bream with his left hand. It shows Ebisu is the deity of sea. As mentioned above, Ebisu is the symbol of trading and business. To make a great profit, doing business beyond the sea is inevitable. Therefore, almost all business persons need Ebisu’s help in order to be protected from bad fortunes. This is one of reasons why people visit shrines and temples on January 10th. Another significant thing is that Ebisu is deeply relating to Daikokuten as the land and the sea need each other. As mentioned above, Ebisu is the deity of sea and Daikokuten is the deity of land. The relationship of the two deities is also circular as well as that of the land and the sea. Therefore, people need not only Ebisu but also Daikokuten since a lot of business and daily activities are carried out on the land. There is a Japanese proverb “Saki Daikoku ato Ebisu (First Daikokuten and next Ebisu)”. This is a faith in which, if visiting Daikokuten and Ebisu in order, much more happiness may come to you. The order is the same as the flow of water. Water flows from a river to the sea and comes back to the land as rain. Firstly, Daikokuten which is the deity of land gives happiness and hopes and secondly Ebisu brings wealth and prosperity to you. This is the happiness cycle. 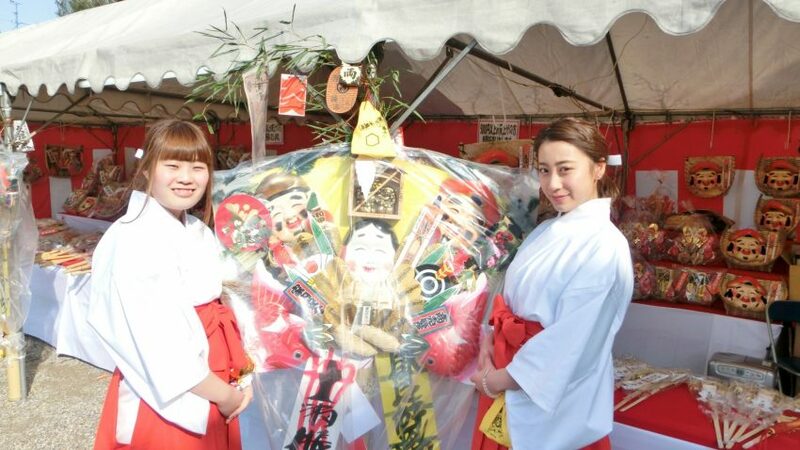 In Katano, Sumiyoshi Shrine holds Toka Ebisu Festival from January 9th to 11th. Many visitors come to pray for their happiness and peace. They also buy bamboo decorations from Fukumusume girls who give us good lucks. In the festival, you will repeatedly hear the following chant; “Shobai Hanjyo de Sasa Mottekoi”. If bringing a sprig of bamboo, you may achieve prosperity in your business. This is the rough meaning of the chant. 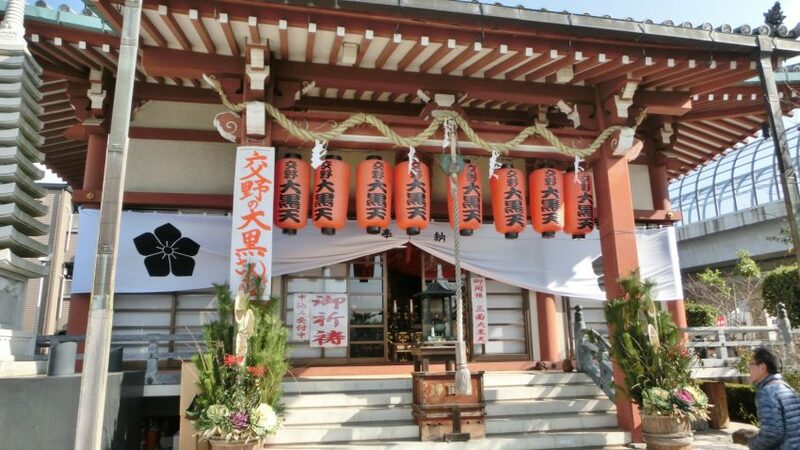 In Katano, furthermore, Hannyaji Temple hosts “Katano Daikokuten Festival” from January 9th to 11th. Hannyaji Temple is one of Nishiren temples in Katano. The temple was originally named Genkoji Temple and was protected by local people as an associate temple of Sumiyoshi Shrine. Now, four monks including Master Nichiyu Hanya manage the temple. Hannyaji Temple has an old figure of Daikokuten which allegedly has been made in the Muromachi period (14C to 16C). Hieizan Enryakuji Temple houses the same figure as Hannyaji Temple. Daikokuten is said to model an entity that has guided Hieizan for Master Dengyo. Therefore, Enryakuji Temple also worships Daikokuten. 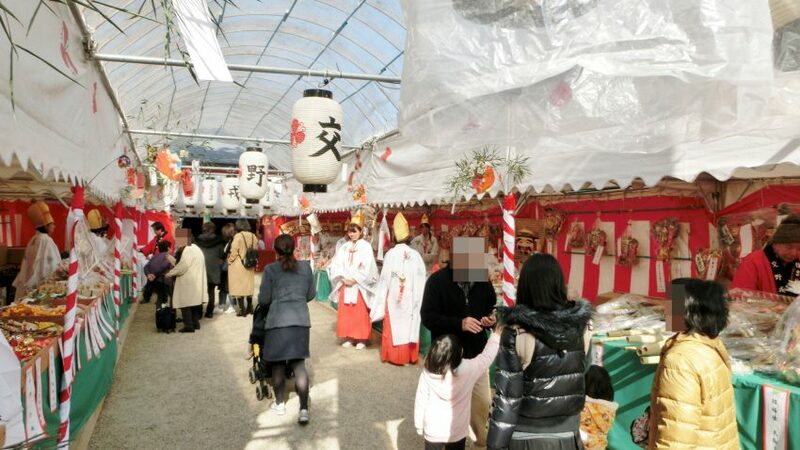 Hannyaji’s Daikokuten was not a well-known cultural asset among general people until the temple started Katano Daikokuten Festival ten years ago. However, the priest of Sumiyoshi Shrine suggested co-hosting Katano Ebisu and Katano Daikokuten. As I mentioned above, Ebisu and Daikokuten are deeply relating each other. If visiting the two deities in Toka Ebisu Festival, much more happiness may come to you than visiting one of them. Fortunately, Hannyaji Temple is a five-minute walk from Sumiyoshi Shrine. To revitalise Katano again, hence, the shrine may have attempted to hold Katano Ebisu Festival with Hannyaji Temple. Fukumusume (Lucky girls) bring happiness to the visitors. Master Hanya says that about 2000 people come to his temple during the festival. The purpose of Katano Daikokuten Festival is to spread Daikoku’s luck to people all over the world. This is based on the idea of “Fukutoku Enman” Master Hanya recommends. The meaning is that happiness and prosperity make people harmonised beyond boarder. Hannyaji Temple holds various events to aim at perpetual world peace through a year. Katano Daikokuten Festival is also regarded as one of them. Particularly, Daikokuten is the symbol of happiness and prosperity as well as Ebisu. Therefore, in Katano Daikokuten Festival, a lot of local citizens who approve of the temple’s idea come and support the festival. The visitors pay their respect at the figure of Daikokuten and head to an event place. 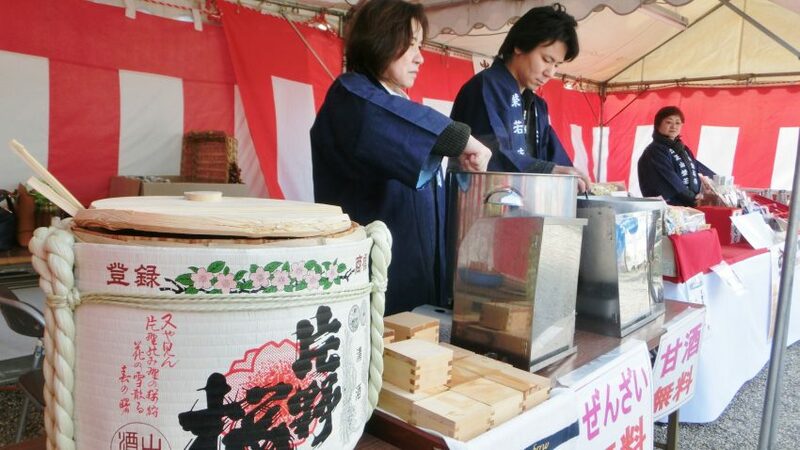 During the festival, the temple offers free welcome drinks such as Amazake (Sake lees drink), Zenzai (red beans soup), and Omiki Sake (Katano Sakura made by Yamano Shuzo) for the visitors. I saw many visitors enjoy the festival despite the fact that it was a bit cold weather. 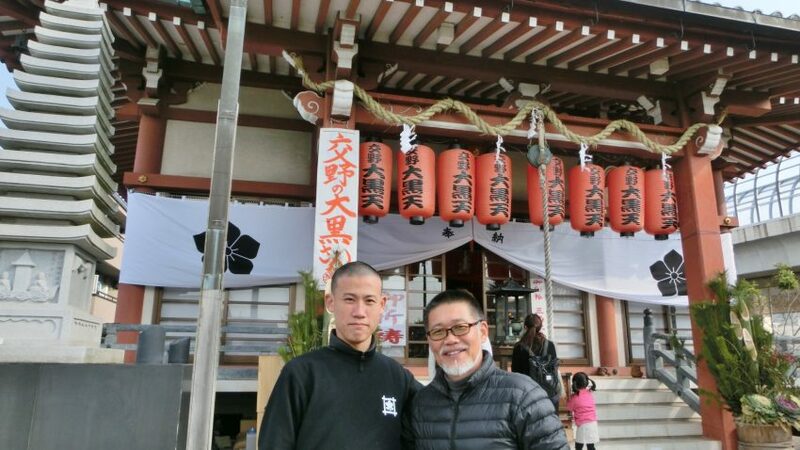 I got a chance to interview Master Hanya and Mr. Daifu Nishizawa who was one of the four monks in the temple. They told me the historical background of Daikokuten and their temple. They said that “we hold such a festival for expressing our gratitude not only to Daikokuten but also to our ancestors who have made a lot of efforts to build a peaceful and affluent society.” Therefore, “we hope much more people come to our festival for sharing happiness and prosperity brought by them”. 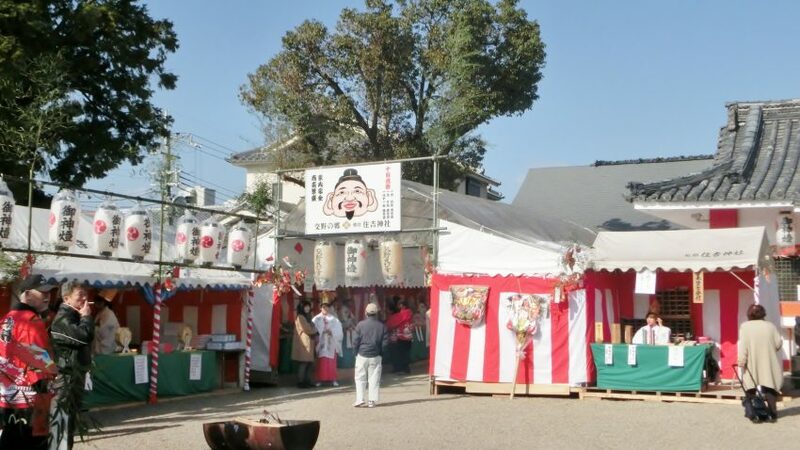 Katano Daikokuten Festival can be said to be one of proud cultural events in Katano. I owe many thanks to Master Nichiyu Hanya and Mr. Daifu Nishizawa who have sincerely answered my sudden interview. Without their help, I was not able to write this essay.